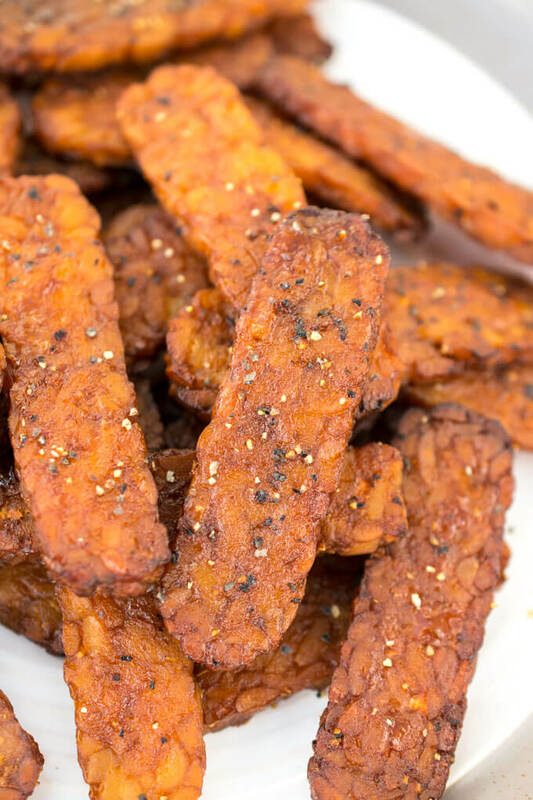 Black Pepper Tempeh Bacon Recipe | Yup, It's Vegan! Tempeh itself is a food made from whole soybeans that are cooked and then cultured, forming a solid shape that can be sliced thinly like bacon. It has an earthy and slightly sour flavor on its own, but is a sponge for flavors and a great source of nutrition. 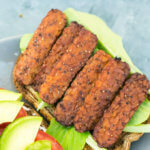 To make tempeh bacon, you’ll marinate tempeh in a seasoned marinade, then bake it in the oven on a rack to get it nice and crispy, while brushing it with more seasoning. Let it cool until crisp and then you’re ready to rock! The whole thing doesn’t take more than a few minutes of hands-on time. Why make tempeh bacon at home? In 2019, there are countless brands of tempeh bacon that you can buy at your local Whole Foods, other natural stores, or even your neighborhood grocer if you’re lucky! Some common brands are Lightlife and Tofurky. 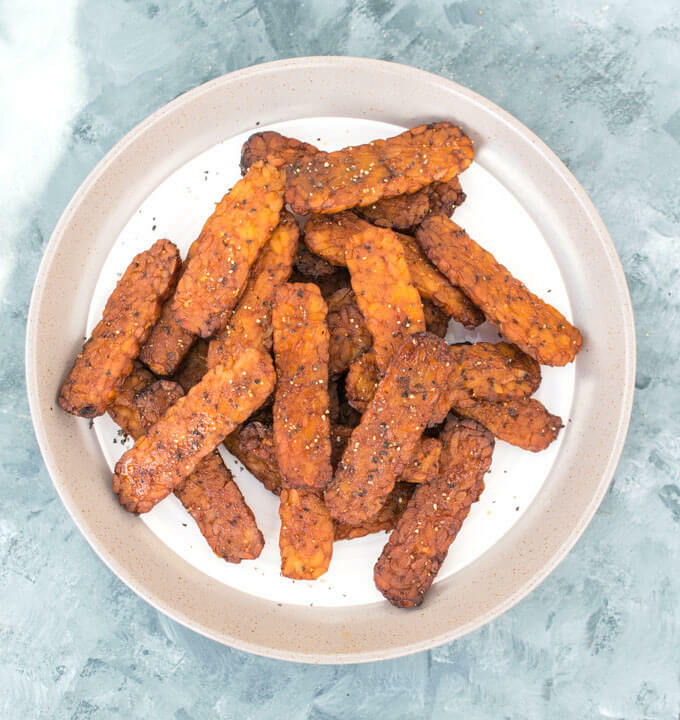 I’ve tried most of the products available to me, and along the way, I noticed that store-bought tempeh bacon never seems to taste as good as the kind I’ve tried at restaurants. I recalled one of my cardinal rules of recreating restaurant dishes (which I often do to save money): use plenty of salt and fat. Many homemade tempeh bacon recipes are fried; my version is baked, as a compromise. Nevertheless, oil is important for both dispersing the flavor evenly as well as for getting the proper texture and for diminishing any tempeh aftertaste. So, if you’re looking for a no oil/oil-free recipe, I’m afraid I don’t have that on offer. That said, the tempeh definitely doesn’t absorb the full amount of oil in the marinade, so it’s not as bad as it might sound :). Is tempeh bacon healthy? I’m not sure if I would go that far. It is a source of some important nutrients but is also made with oil, maple syrup, and some products that are relatively high in sodium, so depending on your needs, it may or may not be an A+ healthy choice. However, relative to other vegan bacon substitutes it’s certainly no worse, and it’s definitely not fattening the way that “real” bacon is. Another reason to make this recipe at home is that you can control the ingredients and guarantee that it is gluten-free by using gluten-free soy sauce or tamari. Soy sauce is a common ingredient in bacon-style vegan foods and does generally contain wheat. 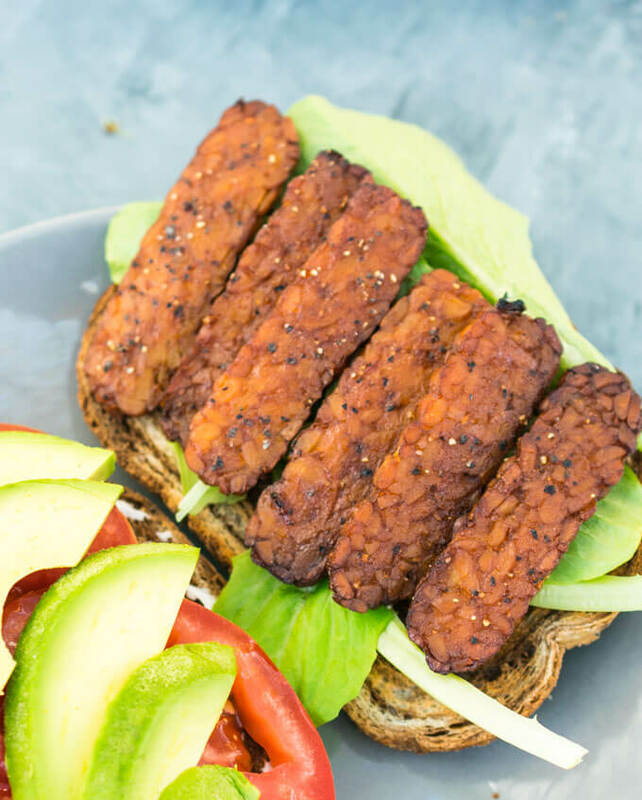 If you give this tempeh bacon a try, let us know in the comments below, or tag me on Instagram (@yupitsvegan)! Smoky black pepper tempeh bacon, made by marinating tempeh and then baking it until crisp. Great on sandwiches or for snacking. Take the block of tempeh and slice it into 32 approximately equally-sized thin strips. I do this by first cutting it in half, then into quarters, then eighths, etc. (see the photos in the blog post). Mix together all of the remaining ingredients in a bowl until well combined. Add the tempeh pieces to the bowl and mix to coat. Let rest in the marinade for about 20 minutes. Preheat the oven to 375 degrees Fahrenheit and set a metal rack (I use my cooling rack) on top of a baking sheet (this is to catch drips). If desired, line the baking sheet with parchment paper to further ease cleanup. 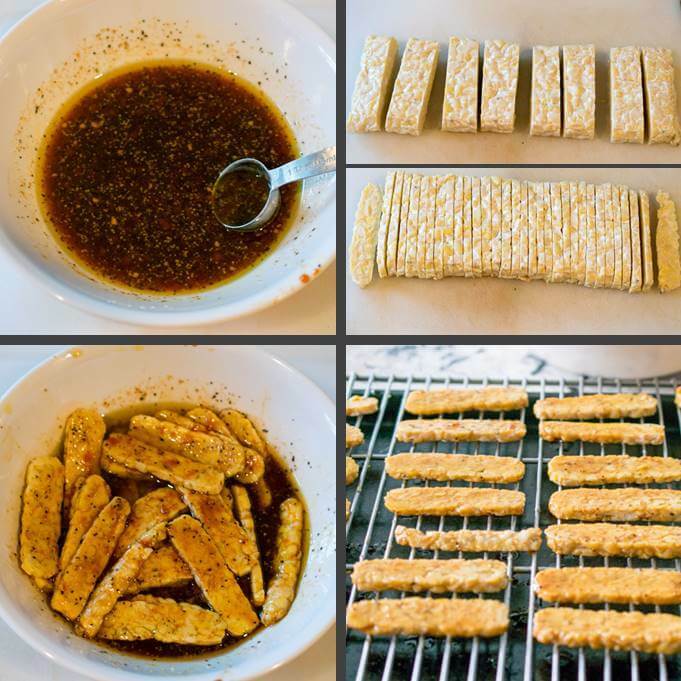 Lay the marinated tempeh strips on the rack, spacing them evenly. Brush them with a little bit of the extra marinade. Bake for 15 minutes. Take the tempeh out of the oven and gently flip over all of the pieces. Brush the other side with additional extra marinade and then return to the oven for about 10 more minutes, or until just starting to crisp. Let cool on the baking rack; the tempeh bacon will become even more crispy as it cools. Leftovers, once cooled to room temperature, can be stored in an airtight container for a few days. HOT PAPRIKA: This marinade needs a bit of a kick to round the flavors out, so I used hot paprika, which I keep in stock. If you don't keep spicy paprika around, use 1/4 tsp regular or smoked paprika, and 1/4 tsp of cayenne or red pepper flakes. NUTRITION: Nutrition facts are calculated using 3/4 of the marinade. Mine absorbed just over half so I've rounded up to be conservative. Adapted from my Tofu Bacon and inspired by Hudson Street Deli. Be sure to also check out my Vegan Rice Paper Bacon for a quicker, lower-fat option!